Last month we were dog-sitting for a week which gave us the perfect opportunity to do the ‘hometown tourist’ bit and explore our local area on foot. We walked over 50k in eight days. I don’t who was more exhausted at the end of it – us or the dog. 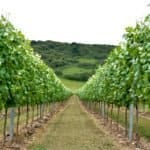 We were blessed with good weather and loved every minute of the glorious sunshine and wonderful Sussex countryside. Of course, I took my camera to take some shots of the Seven Sisters. 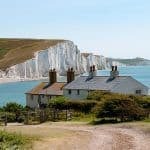 The classic shot is the iconic view of the coastguard cottages with the chalk cliffs and the English Channel in the background. The cottages are featured in the film ‘Atonement’ – this is where Robbie and Cecilia dreamed of living after the war. The area is also shown at the beginning of the film ‘Robin Hood Prince of Thieves’. The cottages are now holiday lets – although one remains home to a stalwart resident. He refuses to let the cliffs eroding, by about a metre each year, force a move inland. 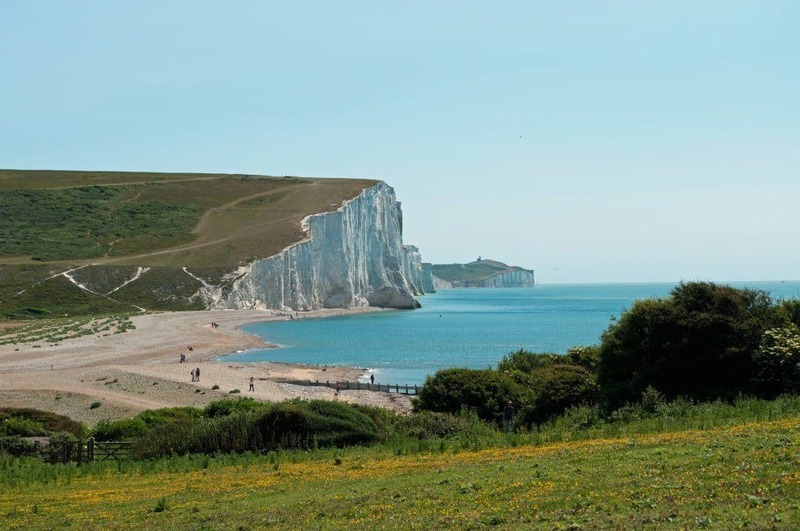 The Seven Sisters cliffs, near Brighton, lie between the towns of Seaford and Eastbourne. 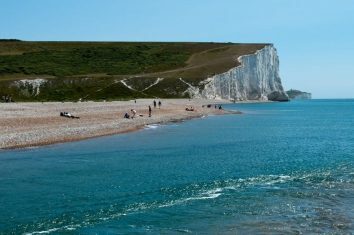 The whiter, brighter sisters are often used as a stand-in for the not so White Cliffs of Dover. 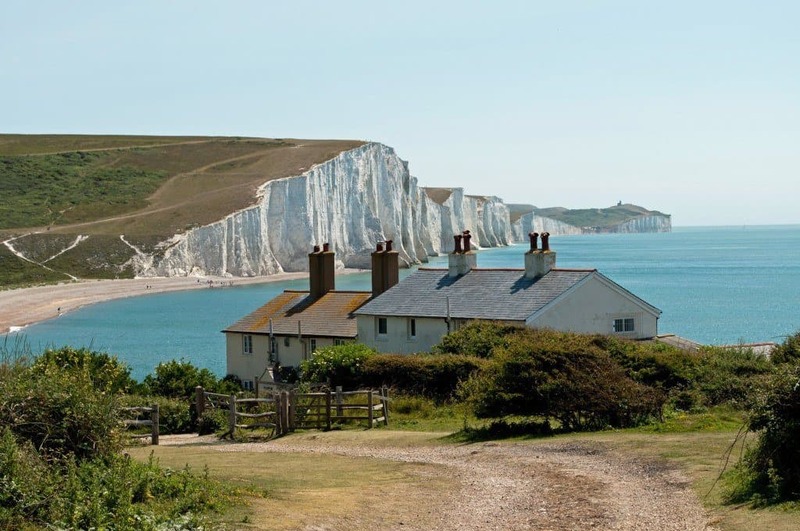 The lack of development on this area of the Sussex coast has preserved the Sisters’ sparkling good looks. 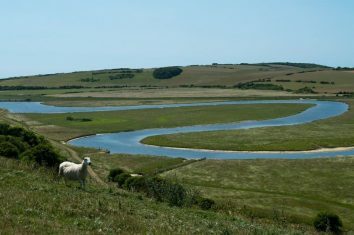 Cuckmere Haven is an area of flood plains where the river Cuckmere meets the English Channel at the beach next to the Seven Sisters cliffs. The meandering river valley has several oxbow lakes. I particularly like this lovely S-shaped bend – my initial! 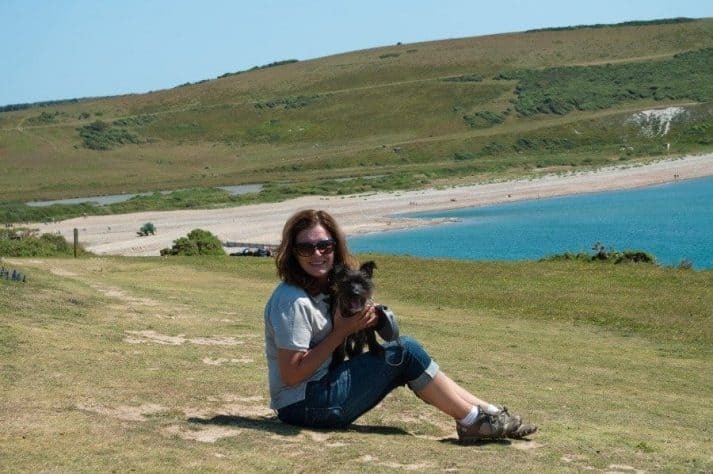 We walked down the west side of the river to Seaford Head for the best view of the cottages and onto the beach. This took around 40 minutes. We then walked back the way we came and stopped at the nearby pub for a drink. After this we crossed the river and walked along the hills to the east which overlook the river as it meanders out to sea. If you want to take in both views give yourself around 2-3 hours including a stop off at the pub! Park at Riverside Car Park which is south of the A259 and the Forest Car Park, next to the Exceat building complex. 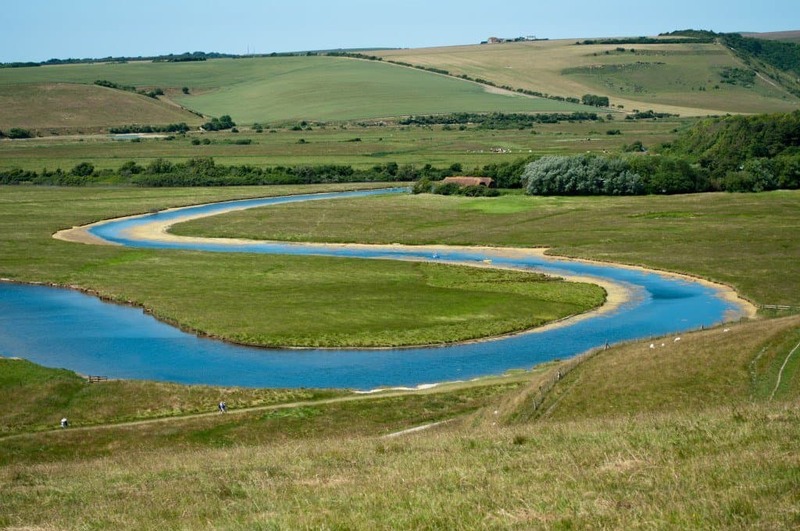 If you’d like to visit Seven Sisters Country Park and Cuckmere Haven there’s more information on the Seven Sisters Website. 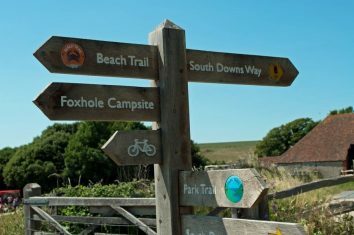 Detailed directions on the walk to the Coastguard Cottages are found here. 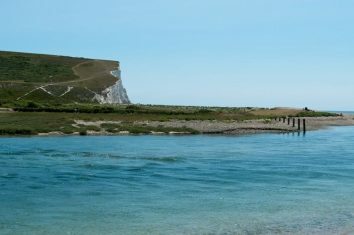 There’s a tea room at the visitor centre or The nearby Cuckmere Inn serves up a nice cold beer and food. There’s car parking at both. 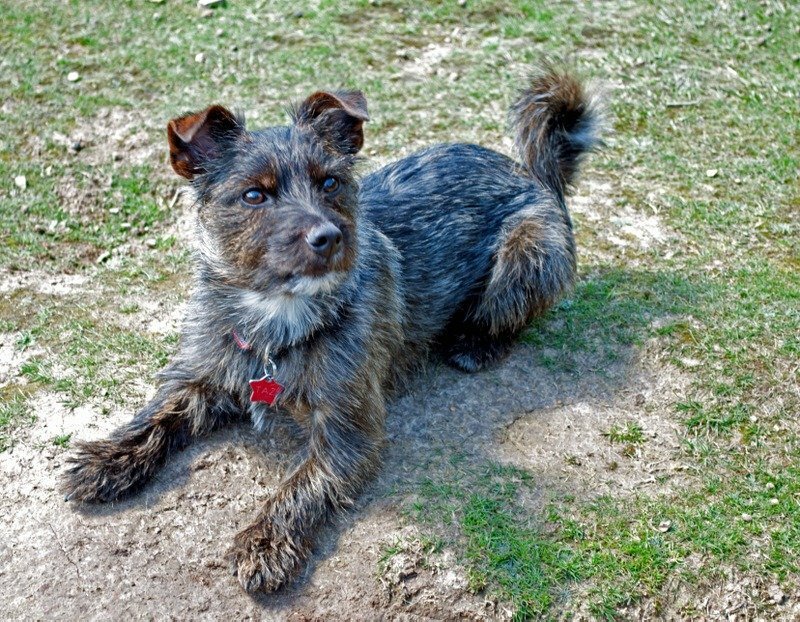 This is Taz; the extremely well-behaved and clever two-year old Norfolk Terrier cross Jack Russell who can walk for England. We think he may also have some Womble in the mix as he likes to pick up discarded rubbish on our ramblings leaving us to dispose of it responsibly when he’s bored with it! Beautiful and stunning pictures. Those cliffs look amazing. Seven Sisters Country Park must be quite a place! Thank you 🙂 – I’d really like to go back in the winter and see it in a different light. You know, we have Three Sister here in the Pacific Northwest and I was wondering to myself if there was a connection between the two names… there are legends about where the name comes from and one is that Methodist missionaries named the peaks and the other is that trappers and fur traders exploring the area gave the Sisters their name. I like to think that an Englishman attached to the Hudson’s Bay Company at Fort Vancouver far away from home remembered the Seven Sisters of the East Sussex shoreline and passed the name along to our Three Sisters of the Cascade WIlderness. Who knows. In my research I discovered our Sister have names, too. I didn’t know that, because everyone always refers to each respectively as the north, middle or south Sister. Their names are Faith, Hope and Charity. And yes, they are indeed beautiful as is the entire Cascade range. Portland sits with a spectacular view of Mt Hood, a magnificent peak in the Cascades. And you may remember Mt. St. Helens, the volcano that blew in the 1980’s… that is part of the Cascade range also which is visible from Portland. I’ll see if I can find out our sister’s names for you – although pushed for time at the moment. Wedding in two weeks….! A new arrival… how exciting! Sorry it’s taken a while – spending Sunday afternoon catching up! Thanks for sharing such amazing insights on these chalk cliffs. These cliffs set against the pristine waters offer one of the most splendid views of the location. 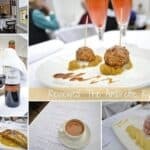 I am so happy to have stumbled upon your beautiful blog and incredible images. I am looking forward to following your adventures. Thank you for visiting and for your lovely comment – all encouragement is gratefully received! Love the second image. Regrettably not an area we got to when living in the south-east. Must do something about that! I’ve lived within a half hour drive all my life and only got to visit for the first time this year! I love UK. These photos are a dream! Lucky you that lived there. Wonderful places! I would visit England as soon as possible! For moment thank you of these photos amazing. 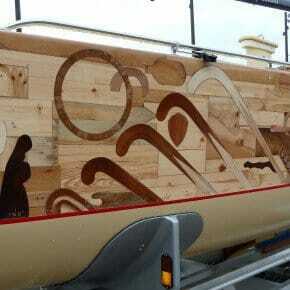 I continue to see your lovely blog and I will follow you! And, finally, I thank you for “Like” on my page of “About me”. Kisses! A very nice description of the area backed up by some lovely photos. Some lovely photos there – looks like Taz had a good walk in the sun! What a marvelous place – the cliffs are beautiful! The views are stunning. I think I’ll go back in winter to see how different it is – might be nice for a comparison blogpost. Lovely photos Suzanne, expecially the first two. Glad you had the good weather too. Would love to visit myself one day. That cottage shot with the 7 sisters behind is sublime, Suze. I could so easily spend an afternoon doing this. I think the Thelma and Louise site organised a walk along here some time ago. Wish I’d been able to go. Gosh 50k in eight days – impressive. The scenery looks beautiful especially the chalk cliffs. That’s the thing – the scenery was so lovely we just kept going, and going, and going…! 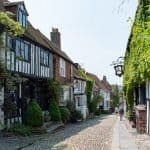 I’ve never been in Sussex, but just get a great desire to do so. Thanks for this view of the country. I would love to see those cliffs. They are stunning and your photos are great! Thanks Colin – shame we’re at the other end of the country from you!